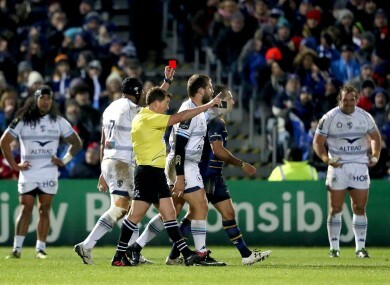 Referee JP Doyle shows Frans Steyn of Montpellier a red card at the RDS earlier this month. MONTPELLIER FLY-HALF FRANS Steyn has lodged an appeal against the four-week suspension he received for a high tackle on Johnny Sexton at the RDS more than two weeks ago. The South African native was sent off for the late hit on the Leinster fly-half in their Champions Cup clash and subsequently received a four-week ban from an independent disciplinary committee. Steyn’s tackle was adjudged to have resulted in reckless contact with Sexton’s head, in contravention of Law 10.4 (e). The incident saw Steyn sent to the line in the 27th minute while Sexton went for a head injury assessment before later returning and helping Leinster to a 57-3 victory. Steyn’s appeal will be heard via conference call tomorrow by an appeal committee consisting of chairman Rod McKenzie (Scotland), Roger Morris (Wales) and Simon Thomas (Wales). Email “Montpellier's Steyn appeals four-week ban he received for high shot on Sexton”. Feedback on “Montpellier's Steyn appeals four-week ban he received for high shot on Sexton”.